That Lael Wilcox , who was at the time a relatively unknown rider, broke the women's record for the 2015 race was impressive enough. But Wilcox's accomplishment borders on the superhuman when you consider that she had ridden to the start of the race from her home in Anchorage—some 2,100 miles—and then proceeded to mop up the competition with her 17-day, 1 hour, and 51 minute finishing time, all while battling a severe respiratory infection. 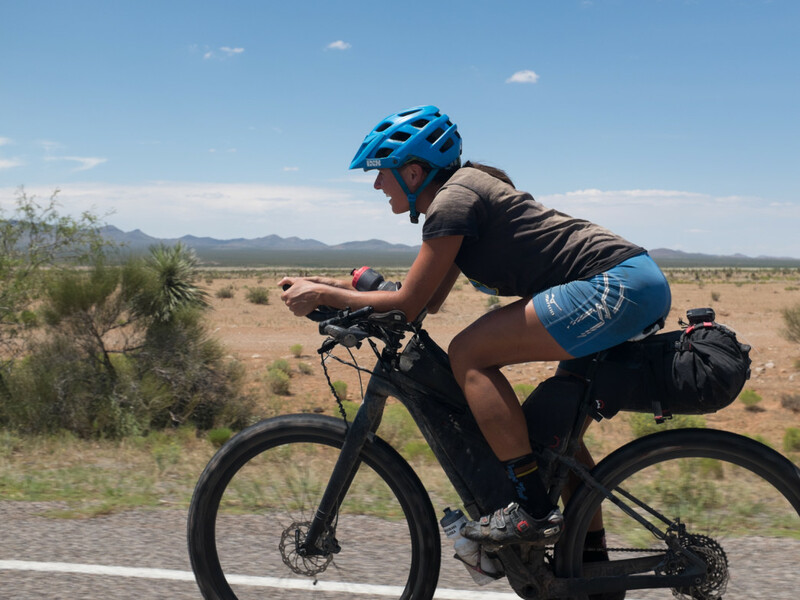 With that feat, Wilcox put herself on the map of endurance athletes to watch, a genuine rising star in the exploding world of bikepacking. 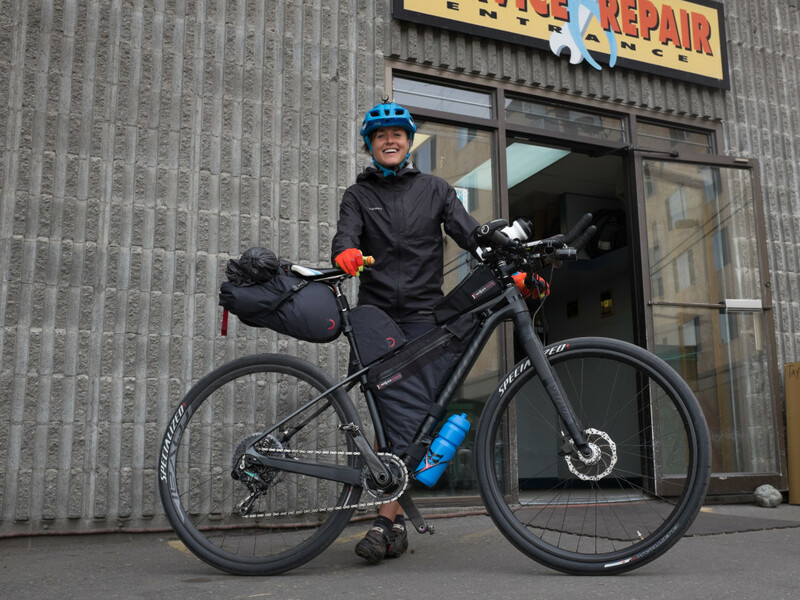 She's now gearing up for her next adventure: the Trans-Am Bike Race, the longest self-supported race in the U.S., which begins on June 4 in Astoria, Oregon, and Yorktown, Virginia (of course, Wilcox is riding to the Oregon starting line). Riders have the choice of riding the 4,400 miles in either direction, but the stretch that passes through Colorado, with its long grinds up Rocky Mountain summits, is sure to be among the toughest climbs no matter how they tackle it. The race runs from Walden south to Pueblo, passing through other towns including Breckenridge and Canon City. A friend recently described a mountain biking venture as being similar to meditation, with feelings of being “blissed out”. Have you ever had a similar experience? Most of the time I spend riding feels like this. I feel my best when I'm riding or running or moving in general. It makes me feel both relaxed and excited. I feel like I can think clearly, like I have my best thoughts. How would you explain to someone unfamiliar with the sport why you do it? Not sitting down for meals, for example, seems pretty tough. I don't race too often; mostly I just ride for fun. I've been traveling by bike with Nick for the past eight years. We typically spend half of the year traveling and half the year working to save money for our next trip. We've ridden over 100,000 miles together in over 30 different countries. We started road touring and have trended more and more to mountain bike travel because we like the mountain life. It's more challenging, but definitely way more invigorating. We sleep outside almost every night of the year. I like to spend almost all of my time outside. I just started bikepack racing last spring on a whim. 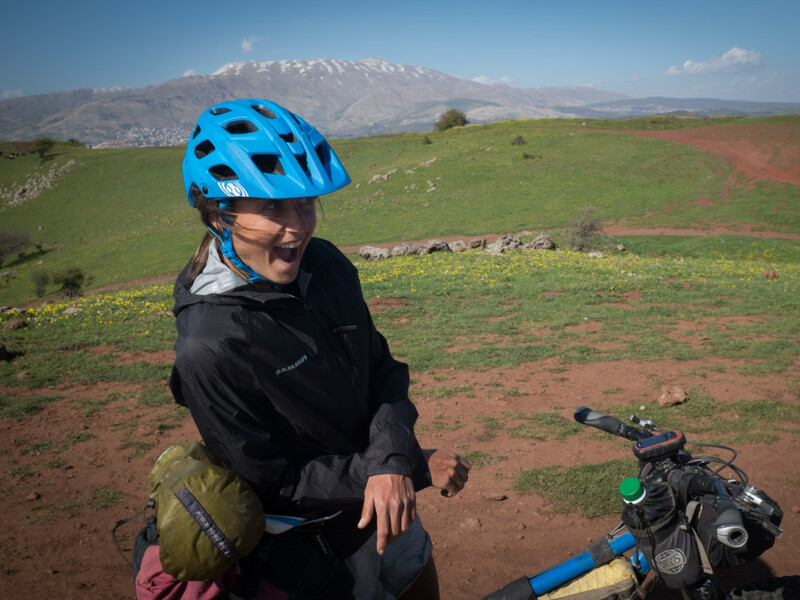 We were riding in Israel, following an 850-mile route called the “Holy Land Challenge.” I realized we'd be there during the race in April, so I figured I'd give it a go. I was the only girl and the youngest rider. I raced on my beat up steel hardtail and had an awesome time. 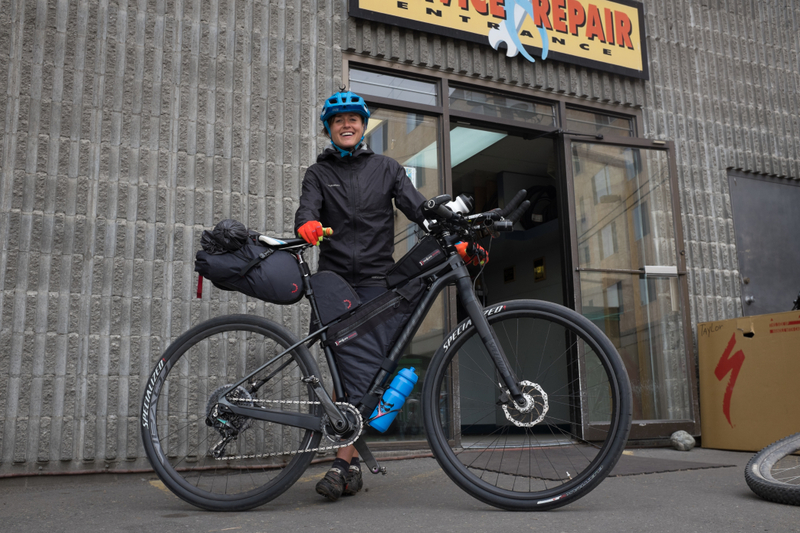 Before racing the HLC, I made my master plan: If the HLC went well, I'd fly from Israel to Anchorage, and ride my bike 2,100 miles from Anchorage to Banff in May and race the Tour Divide in June. I had so much fun on the HLC that I went forward with the master plan. And the second part of the question—about the suffering? There is a big difference between suffering and discomfort. Suffering is pain that is entirely out of your hands. You can't control it and you can't understand why it's happening. To be competitive in ultra endurance events requires deprivation. It's all about staying on the bike and moving forward. I realized if I ate on the bike, I'd save time. In fact, I realized I could do almost everything on the bike besides sleep—sleep is essential and the thing I miss most while bikepack racing. On average, I slept four hours a night. I'd try to fill the other 20 hours of the day with as much riding as possible and for the most part, I loved it! I had so much time to think and see new places and be myself. However, I have suffered during these races. During the Tour Divide in June I suffered from breathing problems. During my solo Tour Divide Individual Time Trial in August I suffered from depression. Suffering is something that happens during intense challenges. It is not what I seek, but it's part of the process. Racing is a time game to see what's possible. Race results stand alone. They are exact numbers that show how people stack up against each other. There are so many stories behind race results, but they're also just finite numbers. I get a huge boost from accomplishing what seems impossible. I'm not usually racing. I do a lot of other riding—in fact, I ride a lot always and everywhere. You’ve experienced some difficulty breathing during particularly grueling bikepacking races. What’s the latest on that? I had trouble breathing during the Tour Divide in June. After nearly a week of racing sick, I rode myself to an Urgent Care in Helena, Montana. I had an albuterol treatment and they gave me a prescription for an inhaler and antibiotics. I got much better, but still had a smoker's cough for the rest of the race. I used the inhaler for my solo time trial on the Tour Divide in August and had no breathing issues. In October, I attempted a speed record on the Arizona Trail and didn't use the inhaler and got sick again and had to quit. I don't know what's wrong with me, but I seem to do fine when I use the inhaler. I think breathing so much dry, dusty air might be part of the cause. Can you tell me a little about the Baja Divide route? Will this become another Tour Divide-type race in the future? I've spent the last two months in Baja, Mexico riding with Nick. We rode across the border from San Diego in December. At first, we weren't planning on producing a route, but we enjoyed the riding so much, we decided it was worth sharing with others. The Baja Divide is shaping up to be a 1,700-mile mountain bike route down the Baja Peninsula from San Diego to San Jose del Cabo. We're currently in Vincente Guerrerro [in Baja California]. Yesterday we rode away from the tallest mountain range on the peninsula towards the Pacific Ocean. Today we'll watch a local MTB race and meet riders that can help us navigate the area. Tomorrow we'll ride southeast past an abandoned ranch called Nueva York on our way to Bahia Los Angeles. It's a really fun project. We will publish a GPS track of The Baja Divide this spring and a paper map thereafter. On January 2, 2017 we'll be in San Diego and have an open invitation for anyone that wants to ride the route with us. It is not a race. People can ride as fast or slow as they want and must be able to take care of themselves. I'm inviting a lot of my friends. It should be a huge party! Can you tell us any strange or particularly funny experiences that you've had on long distance rides? I met some characters on my ride from Anchorage to Banff last May. I stopped at the Bell 2 Lodge on the Cassiar Highway for snacks. Bell 2 is a heli-ski lodge and the only man-made structure for a hundred miles in each direction. As I rode in, I noticed an air compressor and figured I'd top off my tires before sitting down to a cup of coffee. I filled up the tires and walked around the corner of the building to look for a rag to clean my chain. Then I heard a bang! It echoed through the valley like a gunshot. Oh no! I put too much air in my tire and it blew off the rim. Three guys came around real quick—they thought a gas tank might have exploded. A slim cook in an apron and a mechanic in blue coveralls came running to see what happened. Then Franz, the German lodge owner, pedaled over on a Kona 29er. Together, we tried to reseat the tire, but it was a bust—the tire was too stretched out. I knew the only solution was for Franz to give me the tire off his bike and told him so. Man, he really didn't want to give it up. I was desperate. I offered him my emergency $100 dollar bill and he just laughed—he doesn't care about money, he likes his bike. I said I'd do anything—I'd wash dishes, I'd work. He said that he was going to Smithers in a couple of days and I could just wait and get a ride with him. But I really wanted to ride my bike! Smithers is about 200 miles away from Bell 2 and has two bike shops. Franz and I went back and forth debating the tire and the situation. Finally, we agreed that I'd borrow his tire and leave it for him at the shop in Smithers. As I was leaving, Franz asked if I was hungry. I was so frantic about the tire that I didn't realize I was famished. He invited me to eat the staff lunch he provides for his workers. The cook brought me into the kitchen and gave me a plate so I could help myself to their backcountry buffet—freshly cut watermelon, hot ham and cheese sandwiches, and salad. On my ride to Smithers, I saw zero people and at least 20 bears—including an albino black bear. I made it there on the second night, but had to wait in town for the bike shop to open in the morning. I bivvied in the bushes next to a mountain bike trail and in the morning I'm at the shop buying a tire when I hear a German accent—sure enough, it's Franz! He sees me and he's speechless and I laugh and he laughs. On his drive in, he was keeping an eye open for me on the road, but figured I was probably sleeping in a bush cause he didn't see me. I tell him about the white bear and his eyes get wide with reverence. I ask if maybe I can come back and work for him sometime and he says sure. I give him back his tire and buy him a new tube because I ruined his. Then he heads back to Bell 2 and I continue down the Yellowhead Highway to Jasper. After I broke the women's record on the Tour Divide, I sent Franz a postcard. Maybe I'll see him this May when I ride to Oregon for the Trans-Am Bike Race.